Think heat styling your hair means damaging it? (Us too, if we're honest...) Think again! Cloud Nine’s innovative styling tools deliver exceptional results without the damage, thanks to mineral-coated barrels and temperature control technology. Allowing you to create a huge array of looks – from soft waves to tight curls – this super-smooth curling wand features a 25mm coated barrel to create a long-lasting, glossy finish. The variable temperature allows you to choose the heat best suited to your hair, while the swivel cord and ‘hibernation’ mode mean you can style without a care in the world. From effortless, beachy waves to full, tight curls via subtle volume boosts, The Curling Wand by Cloud Nine will change the way you style your hair, thanks to innovative technology and award-winning results. This mineral-coated barrel will leave a long-lasting, glossy finish – it’s slow baked and coated to enhance your hair’s natural shine and polish – whether you’re creating tight curls or soft tousled waves. The other standout feature is innovative temperature control technology, which offers a range of settings from high to medium to low, so that you can choose the temperature which best suits your hair and style (in general, hotter temperatures suit thicker hair while cooler temperatures are better for finer, shorter hair). The one-touch temperature control lets you change the heat setting easily, with a clear LED display so you’ll always know which heat you’re at. 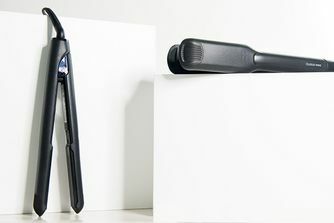 For safe, effortless styling, the wand also comes with a heat protective glove and a protective guard. As if that wasn’t enough, this magic wand also features a swivel cord for complete freedom when you’re styling and a ‘hibernation mode’ which disables it after 30 minutes of inactivity – so you can forget the familiar ‘did I turn them off’ panic routine.